Last month, The HSUS held their annual "Taking Action for Animals" Conference (TAFA) which brings together animal advocates all over the country. We've always done search ads, blogger outreach, and posts on our social networking profiles, but this year, I was ready to take it to the next level. I wanted to make this a social conference. And I wanted to prove that it could be done, even if we weren't SXSW or NTC. Many people think that only "techie" conference attendees will grasp ideas like live-blogging and tweeting. But we proved that if you make people aware of the tools and start early, it can be done! But the reasoning goes beyond just something that I wanted to do. The great thing about social networking is that it breaks the ice. Attendees want to meet and network at conferences, but they don't know how to get started. Providing an outlet using social media gives them that opportunity. The benefit for us is that we'll know more about our attendees, identify them online, stay connected with them, and tap into their own networks. Conference Twitter Feed - the official conference Twitter feed was used to promote the conference ahead of time and keep the momentum going after the conference by staying in touch with attendees. During the conference, we had someone tweeting "housekeeping" items like schedule changes and reminders via Twittermail. We encouraged people to sign up to get our Twitter updates via SMS during the conference. Any highlights were retweeted to @humanesociety, our main Twitter account. We followed anyone who mentioned TAFA on Twitter and reached out to our exhibitors, sponsors, presenters, and staff on Twitter and asked for their help in promoting the conference. Tweetup - This gave those animal advocates on Twitter a chance to meet up in real-life. They talked about everything from the conference sessions to their pets. 1. 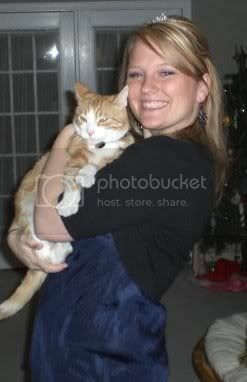 Use TWTvite to organize RSVPs and help spread the word on Twitter. 2. Have it during conference downtime, and not on the first day. Ours was right before the opening remarks and I think attendance suffered because of it. Many people's flights didn't come in till later as well. 3. Have someone well-known in your field attending. Our advocates were so happy to meet Mike Markarian, our Chief Operating Officer. 4. 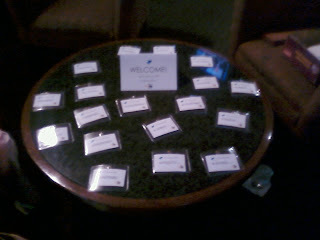 Have nametags, and plenty of blank ones for those who did not RSVP. 5. Have signs at the entrance and on the table with the nametags. I remember feeling awkward at the first tweetup I went to because I didn't know anyone and couldn't figure out where they were. 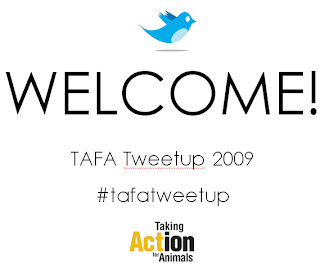 Here, I had signs that included the hashtag for the tweetup, which was #tafatweetup. 6. Don't forget to take photos, especially a group photo! Mashable also has some great suggestions on how to organize a successful tweetup. Booth in the Exhibit Hall - my department had a booth in the conference exhibit hall that displayed all of our social networking profiles and gave us a chance to talk to attendees about using social media. Posters for each social networks showcasing our profiles on each as well as how to fan and follow us via text message, the conference hashtag and twitter feed, and flickr tag. A raffle for a free Flip Camera when someone participated in our "I'm here because" activity. We asked people to fill out a sheet of paper on why they were at the conference, took their photo and posted it on Flickr, and taped all the papers on the wall at our booth. Inclusion in conference materials - we had a postcard included in the conference bags that had wireless connection information on one side and the Twitter hashtag and feed on the other. Every attendee received this postcard. All of this added up to some great success metrics. Twitter stats were obtained from What the Hashtag and Twitter Search. The results were impressive, given that there was no wireless access in the exhibit hall and common areas. That was my #1 recommendation for next year. I'm convinced that it would increase participation drastically. Because we made these tools available, afterwards we were able to take advantage of that “post-conference glow” many attendees have, when they’re jazzed up about what they learned. They have a place to talk about it, and we're able to gather their feedback on the event. Sure, there were plenty of people there that do not use social media, but they either saw the conversations and became interested, or simply ignored it. Our goal was to create a "cool factor" for those who were interested, and I think we succeeded! Please feel free to share your thoughts, particularly if you've had experience with using social media at an event. Here are some good references that The HSUS has been written up in and I've been interviewed for about how we use social media. Fast Company - "Three Inspired Social Media Profiles"
Fast Company - "Best Promotion of Social Media Efforts by a Big Brand: And the Winner Is…"
Ragan Communications - "Why Nonprofits Need Social Media"
Chicago Tribune - "How Nonprofits are Using Social Networking to Raise Money and Awareness"
Nonprofit Marketing Guide - "Market Your Cause on Social Media -Yes You Can!" Atlanta Internet Marketing Blog - "How Charities are Finding the Good with Facebook Pages"
Philly.com - "Nonprofits Tap Online Networks to Raise Funds"
The Chronicle of Philanthropy - "Charities Need to Track What is Said About Them Online"
Care2 - "Top 10 Panels at Nonprofit Technology Conference"
Chronicle of Philanthropy - "Top Dogs Raise Funds in Online Pet Photo Contest"
Convio Blog - "Creativity, Collaboration & Community - Three Words to Sum up the TAFA Conference"
MSNBC - Charities Turn To Online Video to Solicit Support"
NTEN - "Seal-ing the Deal: HSUS Brings Another Great Campaign"
The Nonprofit Times - "Social Networking is More Than Tapping a Keg"
NetSquared - "Humane Social Marketing: An Interview with Carie Lewis from The Humane Society"
Care2 - "HSUS Uses MySpace With Suprising Results"
Wild Apricot - "Using Facebook and MySpace for Fundraising and Advocacy - Interview With Carie Lewis"
Beth Kanter - "Using Social Networking Sites for Campaigns: An Interview With Carie Lewis"
K Street Cafe - "Marketing to an Older Generation? Don't Dismiss Facebook"
Beth Kanter - "Carie Lewis Wins $50,000 Microsoft Challenge on Facebook"
Beth Kanter - "Guest Post by Carie Lewis: Sharing is the New TAF"
NTEN - "Best of NTC 09: Confessions of a Social Media Campaigner"